When visiting Mallorca, it is more than likely that you will bump into some of the, around 250.000, dogs that live here on the island and their owners. There are many “famous” or well known people, who either live on or visit the island regularly, who also have dogs. With this in mind we thought we would open up a section within the website and give you a chance to get to know them and their dog, or dogs, a little bit better. We would also very much like to hear about those who live on the island and have dogs and are perhaps not so quite well known!! There are also quite a few people who visit this island and bring their dogs with them, either for short or long holidays or are staying for longer because of work or family circumstances. We would love to hear from you too. 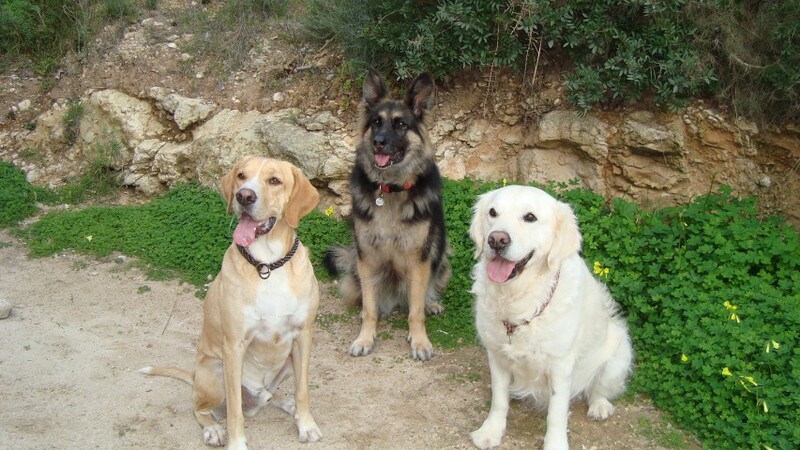 We are looking for a selection of all three types of owners, not that, in all reality, they should differ in the way they care for their dogs, but it is nice to see where people are coming from in relation to their dogs and what they would like to have available on the island for themselves and their dogs. The last 20 years have brought about many changes in our way of living. Nowadays it is not only the 'nuclear' family of father, mother and children living together, but men and women now also live with their own gender. As well as these 'families' we also have a large group of people living alone, by choice, who have decided that life with a pet is the best family they can have. For the vast majority of them that pet is a dog. So why do so many people choose to live with a dog? Well my theory is that the social pressure for people to live together is so full of 'expectations' that many cannot live up to - the “perfect relationship”. It is very difficult to achieve, requires a lot of hard work on both parts and unfortunately means that many relationships do not work out. It is interesting to note that people's expectations are usually way above what they themselves can offer to a relationship. Nobody is perfect, but that is where the fun is, how boring to be so perfect that you no longer need to learn, to experience a variety of things that are sometime painful, sometimes fun and sometimes absolutely amazing. Having said that all of us need someone, we all need company, very few of us can cope with a life completely alone and that is how it should be. No-one needs to be alone, when we cannot cope with people; the perfect companion is our dog. Dogs, if you pay attention, will teach you things that will fill your heart with joy, they show you what is valuable in life, what life means and how to express yourself. They really are the most delightful creatures and the most adoring friends. Please feel free to add your experience with your dog or dogs in the relevant section. It would be great to have a few photos too. Just click on this link and it will take you to the page where you can add your information. We look forward to reading all about you and your wonderful companions. Please note that you will be required to register in order to add your information. If you have any questions, please write to us using our contact page and we will get back to you a.s.a.p.